Honestly, I have been pretty excited about Winter Soldier Bitter March mini-series for a few months now. It has a vintage feel, had a tie-in to Captain America: Winter Soldier, and feels in some blanks for that character during his silent years in Marvel 616. The vintage feel is a huge bonus to a guy with two history degrees and really enjoyed the retro feel of Agents of Atlas. So expectations are high, which means I am ready to crash back into reality. It is 1966 and Hydra has kidnapped two former Nazi scientists who worked for Dr. Zola during World War II. The two have the key to the Alchemy Formula, which would give Hydra unlimited amounts of precious metals which could be used in weapons and to financially cripple the world. S.H.I.E.L.D. tasks their two top agents to the case, Agent Nick Fury and Agent Ran Shen. The two men find they not only have to fight Hydra, but also a figure that is more myth than reality. I think one of the reasons I find myself attracted to S.H.I.E.L.D. is an early exposure and love of the James Bond franchise. James Bond is a super spy and Nick Fury is the ultimate super spy, let us be honest Fury has better toys (see Life Model Decoys). Also, the early Bond movies helped motivate Marvel to move Fury from a war title to a spy title. I was hoping that set in the 1960s this story would have a James Bond feel. And author Rick Remender and artist Roland Boschi nail that feel! There are spy gadgets, super villains, conspiracies to take over the world and really really big lairs! This easily could have been the opening of Goldeneye as two spies infiltrate the enemy base, complete with quips between the two. And some scenes felt very Dr. No. I really liked Ran Shen. And I liked his chemistry with Fury. The two clearly have friendship, trust and a rivalry. The only confusion for me is if he was S.H.I.E.L.D. 's number two agent, where has he been? Why has it taken me until now to hear about him. I mean I know Dugan, and the Countess, and Woo but Shen is not on my radar. Some quick research showed me he actually made his first appearance in December 2013 in another title. And it spoiled me when I did that research for a future read when that title is collected. So beware what you look for if you want to know more about Ran Shen! I really enjoyed Winter Soldier Bitter March and will be picking up issue #2 for sure. 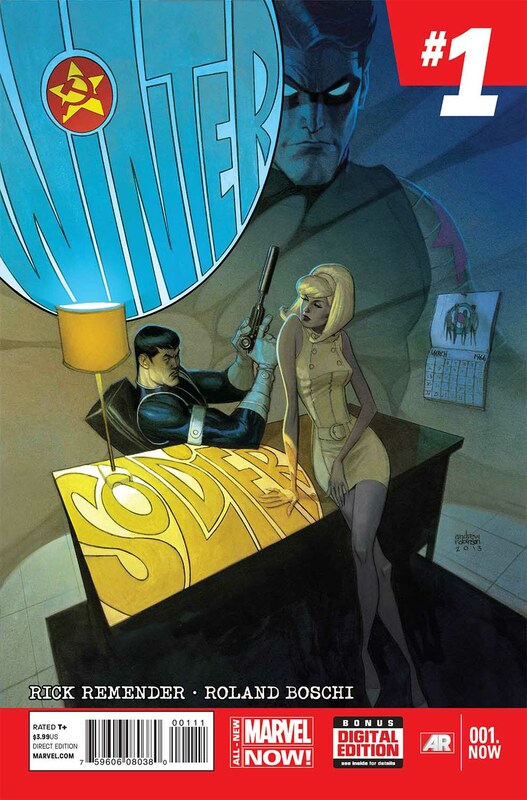 My hope is that we continue learning more about Agent Shen and maybe seeing a little more of the Winter Soldier. This issue really focuses on Shen and Fury. This does make sense since Shen will be the hero of the title (he is on the cover) and as a reader we know very little about him. But I really hope that it does not take too long to reveal our villain in all his glory. My only real complaint is a S.H.I.E.L.D. snowmobile with a little too modern logo, but don't worry the jumpsuits have a vintage logo on their shoulders. Winter Soldier Bitter March was a win for me. I will be back next month and I hope the James Bond feel continues. Agent Shen, you claim to be S.H.I.E.L.D. 's number two agent, I look forward to you showing me! Great review, Daniel! I too had not heard of Agent Shen. I should check out this book.